BREAKING: Oseloka Defeats Ifeanyi Ubah, Others, Wins Anambra PDP Primaries Ahead of Guber Elections. Ahead of the upcoming gubernatorial election in Anambra state, Oseloka Obaze has on Monday, emerged winner of the state’s primary election of the Peoples Democratic Party. 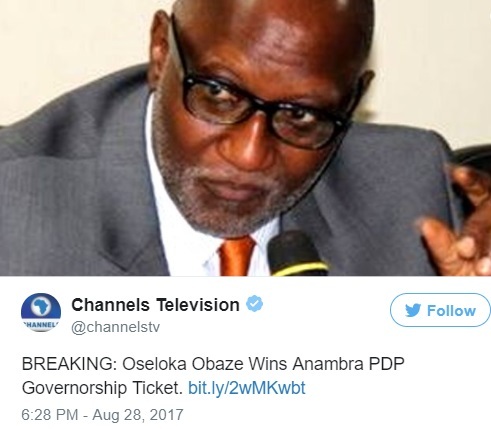 Oseloka Obaze has emerged winner of the governorship primary election of the Peoples Democratic Party (PDP) in Anambra State, Channels TV reports. Meanwhile, Obaze won the PDP ticket 24 hours after Tony Nwoye emerged winner of the governorship primary election of the All Progressives Congress (APC) in the state. Nwoye, a member of the House of Representatives, had scored 2,146 votes to defeat his nearest rival, Senator Andy Ubah who got 931 votes. Eleven aspirants contested for the Anambra APC governorship ticket at the Professor Dora Akunyili Women Development Center in Awka, the state capital.